Reverse speech, which is also known as the human 7th sense, is a phenomenon characterized by deciphering the hidden backward messages in a person’s speech. The concept was popularized in the early ’80s by observing the weird backward messages in the lyrics of rock-and-roll songs. Since then, researchers have reached a progression in their understanding of reverse speech and have discovered that it is also present in all forms of human speech. You may also see speech examples for students. Reverse speech can be determined by recording the normal human speech and playing it backward. It is claimed that among all that gibberish are very clear statements in short sentences that are almost always related to the original sentence spoken by the person. After numerous experiments with the reverse speech’s constant presence, researchers have concluded that it is a natural part of our general speech. 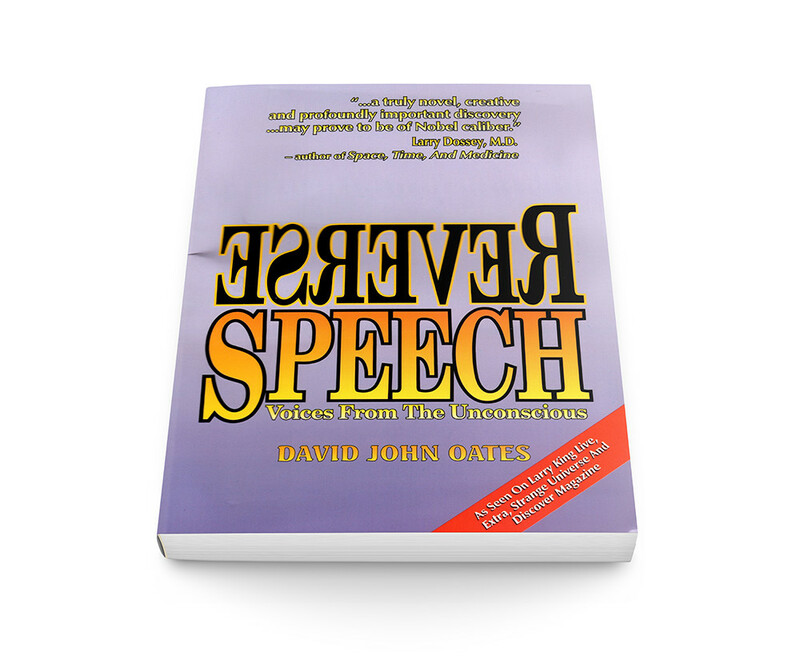 David John Oates is credited with the discovery of reverse speech in 1987. He describes this phenomenon as another form of human communication. He claims that speech is characterized by two levels: the forward and the reverse. He states that the human brain has the ability to construct the sounds that form our forward speech in a way that obscures the reverse speech simultaneously. You may also see how to start a speech. Moreover, he declares that a person’s forward speech, or the sentence he utters, are a mirror of the conscious mind, while the reverse speech, or those that lie beneath the surface of the former, is the unconscious mind speaking. The theory of reverse speech has been applied to a variety of settings. It has even been used as a natural truth detector. Researchers argue that if the general statements of a person are inconsistent, or if the person is lying, the truth behind his words can be found in his reverse speech. If facts are missing from the person’s forward speech, there is a great chance that he is communicating it in reverse. Reverse speech is also believed to reveal thought patterns that are normally unconscious. Recognizing and examining it may lead to the understanding of the causes of a person’s behavior. This theory has even been applied to therapeutic and healing mental processes. You may also like thank-you speech examples. As we’ve already mentioned, reverse speech was discovered because of the unearthing of messages that can be found in the day’s most popular music. Back in 1983, David Oates was working as a youth counselor in Australia. 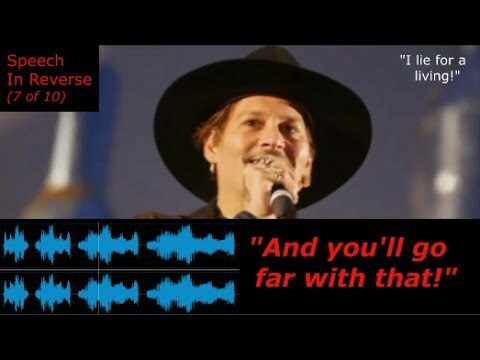 Among the teens that he worked with was one who had a growing concern about satanic messages that are embedded in some of the songs he and his contemporaries listen to. You may also check out appreciation speech examples. With the intention of dispelling this issue, Oates decided to listen to the music to find the hidden messages it’s supposed to hide. But, instead of destroying the myth, his endeavor has come to prove the truth of it. 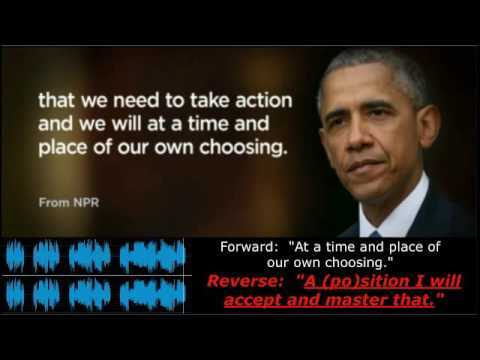 The music indeed contained reversed phrases that were intentionally and strategically placed within the music lyrics through “backmasking.” (Backmasking is a record technique in which a sound or a message is recorded background into a track that is supposed to be played forward. It is a deliberate process that was popularized by The Beatles who used the trick in their 1966 album entitled Revolver.) You might be interested in how do you write a speech? However, aside from these messages that have been purposely included into the music, he discovered other reverse phrases that were not electronically positioned. On that day, David Oates discovered the existence of phrases in reverse that naturally occur in human speech. You may also see launch speech examples. Curious and inspired by his finding, David Oates decided to pursue studying man’s spoken words. By expanding his research, he began to find out more and more cases wherein reverse speech is present. With developed mastery, Oates realized that these reversals occurred in forward speech (or the normal human correspondence) in every 10–15 seconds of talking. You may also like speech examples for college students. Later on, he also discovered that the use of reverse speech is multilayered. Some reversals contained a clear reference to the forward speech that the person vocalized, either contradicting or confirming the simple statements he consciously uttered. While other reversals are mainly self-analyzing. By cataloging and categorizing his discoveries, incorporating his religious background as a reference point, and deriving from the theorems of Metaphors and Archetypes by the early 20th century psychiatrist Carl Jung, he began to formulate the theory of reverse speech. You might be interested in youth speech examples. 1. 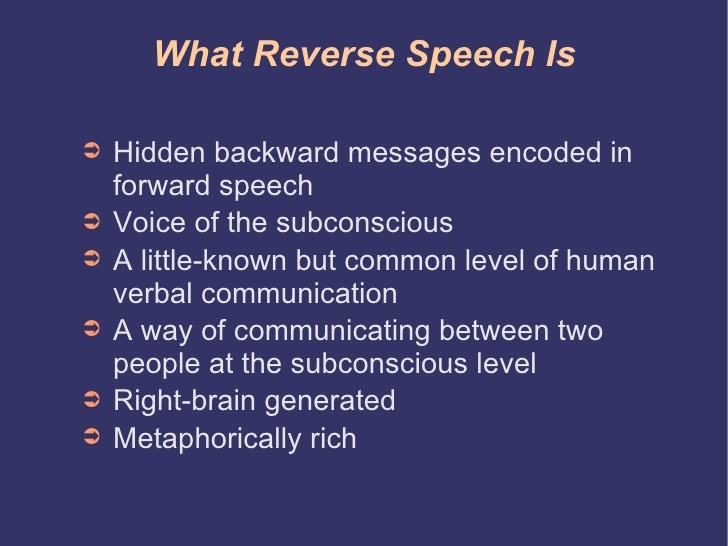 Reverse speech believes that the human speech is divided into two parts: the forward speech and the reverse speech (as we’ve already discussed earlier). Both of these parts function together in the language of a person. However, only the forward speech can be directly and automatically interpreted by the listeners. The reverse speech can only be disclosed if the dialogue is played backward. You may also see wedding speech examples. 2. Although the forward and the reverse speech play different roles, they are very dependent on each other, so much so that they function together. Both parts also play an equally integral role in human communication. In fact, the former cannot be understood without the latter, and vice versa. Both of these parts combined form the complete psyche of the person, the conscious and the unconscious. You may also like presentation speech examples. 3. The reverse or covert speech is developed first. Once a child learns to speak, his articulations are in reverse. After he masters this, forward or overt speech commences, and the two modes of speech slowly combine to form a bi-level human communication process. 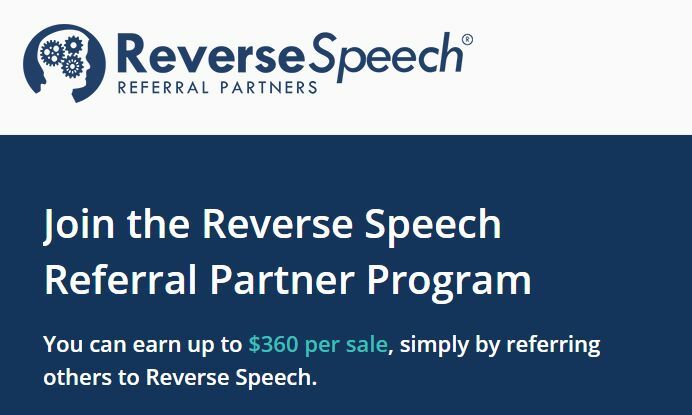 Although this is a relatively new field, reverse speech is already a widespread concept that many people are utilizing. As a matter of fact, in the state of Oregon, reverse speech is being used for criminal investigation. Some have even adapted it for corporate use. Businesses now use reverse speech as a way of gathering more information from corporate mergers and business negotiations. You may also check out dedication speech examples. A problem that ensued among the students of reverse speech is the difficulty to interpret the statements they decipher. In the process of understanding the statements, the students become unconsciously inclined to project their own interpretations and personal experiences into what they are hearing. You might be interested in tribute speech examples. The mind becomes desperate in trying to attach a meaning to the foreign sound that it is hearing, in the form of reverse speech, to the point that it tries to create a meaning to the phrase and sounds they perceive into becoming something that they can relate to. You may also see welcome speech examples. A good reversed phrase or statement will have the same number of syllables for both forward and backward speech. There should be a distinctive vowel sound in each syllable. 3. Clear beginnings and endings. The words must be clear and complete from beginning to end. There must be sufficient spacing between each word, and each one should be clearly defined. The statement, when played backward, will mostly sound like gibberish to the untrained ear. However, beneath those nonsensical sound are clear and distinct reverse phrases. You may also see acceptance speech examples. High level of reversals are characterized by a melodious tonal flow from beginning to end. There is a definite beat and tempo from the phrase’s beginning and end. If all of these seven checkpoints are met, the validity of the reverse speech will be rated with five, which is the highest. If only one of the checkpoints is established, then the rating would be lower. You may also like school speeches examples. 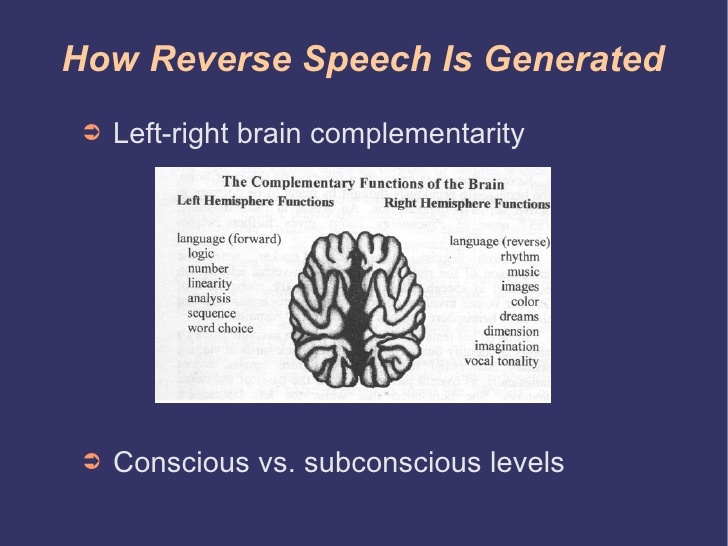 Unlike forward speech, we have no control of reverse speech. It’s simply there, existing with our conscious dialogues. 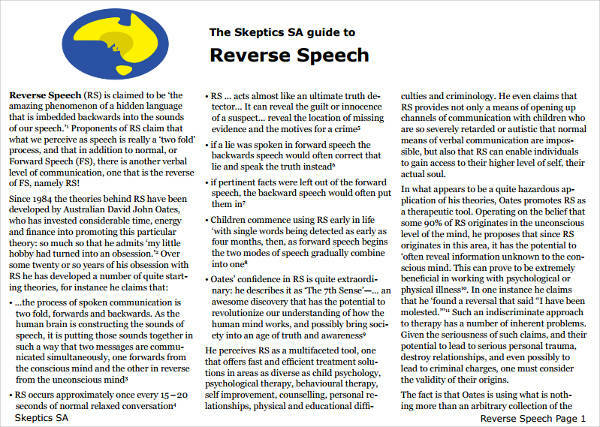 Because of this, it is theorized that reverse speech subsists simply to support the sentient human speech, to provide true insight to the real workings of the mind, and to serve as a window through which we can peer into our own feelings and beliefs, especially those that we try so hard to suppress, whether willingly or not. You may also see campaign speech examples. Researchers and even the pioneer of reverse speech himself have no clear explanation for the purpose of the existence of reverse speech. However, they claim that it is simply there, a natural presence as a part of human nature, along with all other complexities we are yet to understand about ourselves. You may also like speech templates and examples. They also state that reverse speech is there to support humans as we develop or evolve, and to accommodate us as our surroundings and even our human interactions undergo constant change. It is speculated that reverse speech is a tool that men can use as an outlet for their true feelings so that, irregardless of any future developments, we can stay rooted to our genuine selves. You may also check out extemporaneous speech examples. Irregardless of the reason behind the existence of reverse speech, the detail that we must all focus on is the fact that it exists. That it is a part of who we are, and the more we try to understand it, the closer we are to unraveling the many mysteries that the human nature hide. It might take years, even decades to fully comprehend. The best we can do for now is to embrace its presence and hope to have the knowledge to understand it. You might be interested in commencement speech examples.